← New name, same ole blog. I brought these cookies to my son’s piano recital several years ago. People would look at these humble brown circles doubtfully: What were they? Too light to be chocolate, too dark for peanut butter. But then an intrepid soul picked up a cookie and took a bite. One beatific smile was all it took—the cookies were gone in five minutes. These modest, unassuming discs hide a secret: they are packed with explosive flavor. Molasses, brown sugar, a touch of butter, and layers of spices combine in a way that’s rich, deep and complex. As far as I can figure, this recipe originally came from my grandmother. My mom has made them her whole adult life, as have I. The recipe has morphed over the years (big surprise there; since when do I leave a recipe alone?). That time I made them for the piano recital? I’d forgotten that I was supposed to bring treats until an hour before the recital. Oops! I made these because A. they’re my favorite cookies, hands down; B. the dough doesn’t need refrigerating; and C. I had the ingredients—or so I thought. 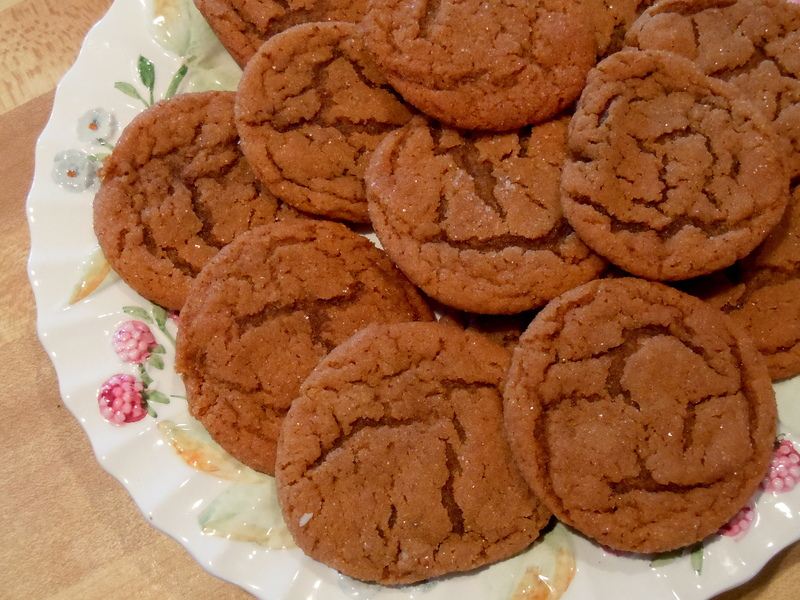 My mother always made molasses cookies with shortening. I had exactly 1/3 cup of Crisco in the house, not even enough for a half-batch. I filled the gap with softened butter. Amazing! They were even better. So of course, the next time I tried making them with all butter. Not so much. The butter battled with the spices. Back to half butter, half shortening, and that’s where we stay. My mom rolls the little balls of dough in sugar before baking. I tried using demerera sugar (Sugar in the Raw), thinking it would add extra crunch. All it did was melt into an odd-textured shell. Back to plain white sugar, but now I add a small amount of the same spices I use in the dough. Sometimes I stick to the traditional mix of cinnamon, cloves, ginger and nutmeg, usually with a sneaky few grinds of black pepper. Sometimes I’ll add about ¼ teaspoon of coriander, cardamom, Chinese five-spice, vindaloo or other sweet-savory spice blends. They’re all good. I haven’t tried adding chile powder yet, since the ginger and black pepper add heat, but it would be fun to experiment with a tiny pinch of cayenne. It’s highly possible the original cookie was only sweetened with white sugar and molasses. I use white and brown sugars in addition to the very necessary molasses. Trying to take the cookies off the cookie sheet too soon gives you a pile of tasty crumbs and mashed cookies. (I learned this the hard way, can you tell?) What works best is to take the cookies out when you think they could really use 1 more minute in the oven, then leave them alone on the cookie sheet for a few minutes. They finish cooking while you stand by impatiently, and they firm up to boot. Try them as a spicy sidekick to a dish of ice cream, individual chocolate mousses (future post! ), or strawberry granita (also future post! ); top them with a dollop of Nutella or bitter orange marmalade; make little sandwiches with cream cheese frosting. Or just savor their complex flavors all on their own. Heat the oven to 400°F. Line a cookie sheet with parchment. In a small bowl, stir together the flour, baking soda, salt and spices. Stir in dry ingredients just until they’re completely incorporated—don’t overbeat. In a small bowl, mix the rolling sugar with the spices. Roll rounded teaspoons of the dough into balls, then roll the balls in the rolling sugar. (Yes, this is a sticky, messy job. Art calls for sacrifice, people.) Place the sugared balls about 2 inches apart on the cookie sheet; they will spread as they cook. Bake for about 7 minutes, until there are cracks on the top but they look like they could use 1 more minute. Let the cookies cool on the sheet for 2 to 3 minutes, then move the cookies to a rack to cool completely. This recipe makes about 5 dozen cookies. They will keep for several days at room temperature in a tightly covered container, but only if you hide them away. This entry was posted in baked goods, sweet stuff and tagged cinnamon, cookie, molasses, spice. Bookmark the permalink. These cookies are calling to me. Love the blog. Is there any way to have recipe card sized print options. Put me on the list to purchase the book when it is published. Peg, I’m hoping to have printable versions of the recipes soon. These cookies really are yummy; let me know what you think if you make them.